If you love the convenience of pizza but don’t want the cardboard boxes at your next party, then you’ll appreciate these smart serving ideas. With these tips and tricks, you can make pizza a hit at any gathering. 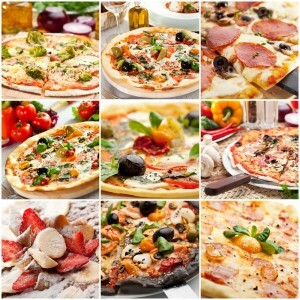 Pizza is one of the most popular foods around, and it’s enjoyed by people of all ages. While the cardboard boxes are commonly seen at birthday parties and casual gatherings, you can make this dish work with your holiday party or more reserved party. The trick is to make it easier to eat and ensure that it looks appetizing on the table. If you’re serving finger foods at your party, then ask the pizza place to cut the pie into smaller slices rather than the wedges. If you forget to put in this request, then just take out a knife and cut it up at home. Once the pie is in more manageable sizes, you can stack it neatly on a decorative plate. If you allow the pizza to cool off slightly, then a pyramid shape will be easier to create and give your banquet a more appetizing look. Use paper or wax-lined doilies between the layers to prevent sticking. You can buy stacking trays that allow you to go vertical with your food displays. Take the pizzas out of their cardboard boxes and display them neatly on these trays. Use disposable paper doilies underneath to absorb any extra grease. A pizza that’s loaded down with ingredients will always look better than a slice of basic cheese without any meat or vegetables. When you order the best pizza in Las Vegas, be sure to add plenty of toppings. You can also get a few different flavors to ensure that all your guests are happy. The key with any party presentation is to leave the cardboard boxes in the trash and just show off the fantastic pizza. With this idea, you can easily add pizza to a baby shower, anniversary party or other gathering. Your guests will appreciate having the option, and you’ll love the fun edge that it gives any party.